Jimmy Hogan in action during Temple’s opener vs. Villanova. 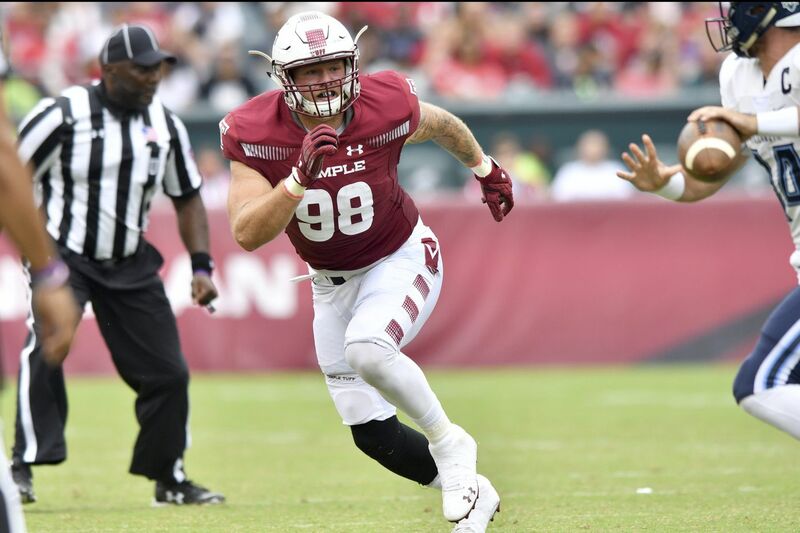 Jimmy Hogan joined Temple's football program in July as a graduate transfer from Rutgers after earning a degree in criminal justice. He has had a greater role than originally expected, with fellow defensive end Dana Levine suffering an injury in the opening game that has sidelined him and Quincy Roche playing at less than 100 percent. The 6-foot-4, 265-pound Hogan is a graduate of North Jersey's Ramapo High. He has started all three games for Temple and has recorded five tackles. He played in three games for Rutgers last year. Question: How has the transition been to Temple? Jimmy Hogan: It has been a lot of fun. Philadelphia is pretty cool. I have some classes in Center City. The football team is starting to feel pretty good, I feel everybody is starting to click, and we are ready for this game Thursday and I am excited. Were there other schools you were considering before choosing Temple? JH: After the football season, I had Wake Forest reach out to me also. Once I was done with my senior-day walk, I wasn't sure I wanted to play another year, but I am happy I did. What master's program are you enrolled in? JH: I am in the master's program for entrepreneurship. I am exploring the field. I am not really sure what I want to do when football is over, so I am reaching out everywhere, to see what I might like. You are seeing more playing time than you did at Rutgers. What has that been like? JH: That makes me a little happier, too — I am not going to lie. I am happy playing defensive end again. They had me playing inside at Rutgers last year. I didn't really feel comfortable doing that. I felt like I was a lighter guy inside. Now I am happy. Whether it is 20 snaps, 40 snaps, five snaps, I am willing to do whatever it takes to help the team win. How did Saturday's 35-14 win at Maryland feel, your first victory as an Owl? JH: It felt great. We needed that as a team. We all know how we can play and just have to do it on a consistent basis, and I think we will. How has it been, coming to Temple and basically starting all over again? JH: It was a little slow to begin with, and the kids started reaching out to me. I am friendly with most of the guys on the team now. I fit right into the culture. I try to work as hard as I can every day and stay humble and work for everything I get. How were you academically at Rutgers? JH: I had a 3.3 GPA and graduated with honors in my major, 3.6. I felt pretty accomplished. Temple will play Rutgers but not until 2020. Are you disappointed you won't get to play your old team this year? JH: My dream scenario this year is both teams making a bowl game and playing each other, and then I can see my old friends. We'll see after this season. It is still a dream, but we will see. Coming off its biggest win in years, East Carolina was hit with adversity and it had nothing to do with football. On Sept. 8, the Pirates upset North Carolina 41-19. The following week's game Saturday Sept. 15 at Virginia Tech was postponed due to Hurricane Florence. On Wednesday, Sept. 12, East Carolina, located in Greenville, North Carolina, relocated to Tampa, where the Pirates are to play South Florida in Saturday's 8 p.m. American Athletic Conference opener for both teams. This statement was provided to The Inquirer and Daily News from the ECU sports information department. "A decision was made to relocate the East Carolina University football team to Orlando by bus early Wednesday (Sept. 12) morning. The location was determined based on the track of Hurricane Florence and lodging availability, along with lessons learned from recent past difficulties returning home to an area impacted by widespread flooding. Should this be the case again as forecasted, accessibility and transitional logistics for our next game in Tampa become manageable." So ECU has been practicing in Florida, preparing to face the 3-0 Bulls, who have wins over ACC (Georgia Tech) and Big Ten (Illinois) teams over the past two weeks. "We are dealing with a lot of issues of course with some of our players and their families as we recruit our area very hard," ECU coach Scottie Montgomery said during Monday's AAC media call. "It has been great to be with each other and connected and surrounded by each other and our teammates. Just the love and brotherhood, the family that goes with being with each other in these difficult times." ECU will visit Temple on Oct. 6. Houston scored 49 points last week and still lost by two touchdowns. The Cougars were defeated 63-49 at Texas Tech. "I think we are a damn good football team, who didn't play well," Houston coach Major Applewhite said during the AAC media call. "We are still the same football team who had a phenomenal game (the previous week)." Applewhite was referring to 45-18 home win over Arizona. Texas Tech had 704 yards of total offense and quarterback Alan Bowman threw five touchdown passes and no interceptions. At least on one side of the ball the Cougars played well. Junior Quarterback D'Eriq King completed 30 of 51 passes for 431 yards and five touchdowns, while also adding a rushing score. Defensive tackle Ed Oliver, Houston's consensus all-American, had six tackles and one tackle for loss, but a game like that won't help his already long-shot Heisman hopes. Temple's 35-14 win over Maryland moved the Owls from 11th last week to 7th in this week's AAC power rankings, in a vote among media members. Here is the latest ranking: 1. Central Florida (2-0), 2. South Florida (3-0), 3. Houston (2-1), 4. Cincinnati (3-0), 5. Navy (2-1), 6. Memphis (2-1), 7. Temple (1-2), 8. East Carolina (1-1), 9. Tulane (1-2), 10. Tulsa (1-2), 11. SMU (0-3), 12. UConn (1-2).